In a valve power amplifier, the output stage normally operates on a push-pull configuration. Certain amplifiers use valves in a parallel arrangement for more output, however the design is still based on the push pull theory. In this commonly used design, the power valves work together in a balanced fashion. It is crucial the valves are matched, as ideally each valve should handle the same amount of load/work in the circuit. If the dynamics of the valves are not correctly balanced poor sound quality can result along with overheating & the valves lifespan can often be significantly reduced. Many amplifiers are designed to use power valves that have similar cathode current. Valves produced at the same time will have variations in their cathode current, this is why testing and matching is required. Before matching, we burn-in the power valves by applying a high voltage across the plate and screen. We do not damage the valves in any way during the burn-in process & it does not affect the valves lifespan, but it helps us detect any poor performing valves. Any valves that fail during the burn-in process are rejected. All our power valves are matched based on plate current (IP) which is considered to be the most accurate method. We also check for transconductance (GM) test results, correct heater operation & inter-electrode short circuits. 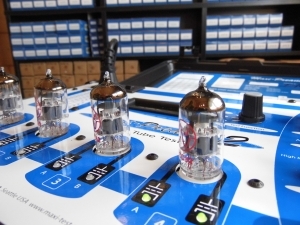 Matched power valve sets with the same (Ip) values are essential in a valve amplifier & help maintain an accurate frequency response whilst minimising distortion. Basically output valves that are matched perform better & last longer! We match our power valves to be within 5% of measured plate current (Ip). Obviously test results can vary slightly between valve types & manufacturers, but generally these tolerances are achievable give or take 2 or 3 percent. We use a precision digital measurement station for testing our preamp valves. Dual triodes and other signal tubes are tested for the electrical characteristics of gain (A), transconductance (Gm) and noise (dBm). During this test process, balanced triodes are selected & stocked ready for use in phase splitter/inverter positions. Unlike many retailers we do not charge extra for this service. 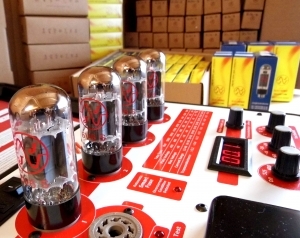 In an all-valve amplifier the phase splitter or inverter will be a (dual triode) preamp valve with balanced triodes, usually an ECC83 (12AX7) or ECC81 (12AT7). The function of this valve is to evenly drive both sides of the amplifiers output stage in a push pull fashion. Whilst an unbalanced triode can be used in the phase inverter position, it can reduce power & compromise the tone characteristics of the amplifier. All our amplifier kits (where required) are supplied with a balanced phase inverter triode. The phase splitter/inverter is often found last in a line of pre amp valves and usually nearest the power valves, (commonly furthest away from the input jack). After the installation of new valves during servicing & repairs, we carry out further specific tests under load conditions. 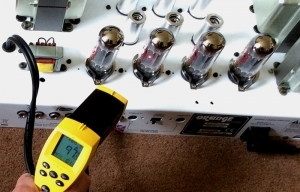 The amplifier is checked for correct operation & at this point the bias settings are adjusted, if necessary. All valves are monitored for performance & output valves checked for temperature balance & stability (pictured right).